Another stockhouse swag magnet that I just realized had a tiny tv on it. Perfect, as I reflect upon the fact that this time last year, my year-round TV Dance Card had 64 shows on it. Now, it's the end of September and we're smack in the middle of fall premieres, I find my DVR at 65% full. A sad state of affairs. Of course, that's after I wiped off a good 30% this past weekend, and have three hours of that Ken Burns' National Parks documentary sitting on it. I can't figure out if we're still feeling the effects of the strike, or the dismal economy, but I don't know what's up with Fall TV this year. This is the first time in years that I haven't gone to the Paley Center premiere parties, where they preview the new shows a couple of days before they air. Not a one show was worth rushing up to Midtown after work for me. Sad. So what's left on the roster, and left to try when they air*? Picked a Scotland magnet, because today, in 1829, the Bobbies started operating as the Scotland Yard. And, even if Scotland Yard is really London's Metro police who just took their name from Great Scotland Yard (a street in Whitehall, London), I'm still using this magnet my sister brought back for me. Because I can. 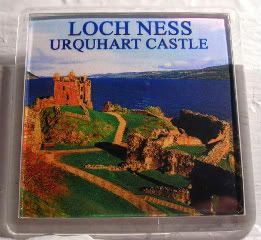 Urquhart Castle was once the largest castle in all of Loch Ness, and because of its strategic importance, it's been the site of many historic battles. She can't help it, methinks. I mean, the castle's been around since the 13th century, before ultimately getting blown up in 1692. Now, you can run around the ruins, climbing the five-story tower to get the best views of the loch. Or, check it out, if you don't get motion sickness, there's a 360 virtual tour of the grounds. Pretty neat. By the way, I'm totally not a MacDonald, but that's part of David Tennant quote from an old radio interview. Three major historic families owned this castle over the last 500 years - the Durwards, MacDonalds and Grants. They didn't tie him to this castle in his episode of Who Do You Think You Are?, but when have I ever passed up a chance to mention David? Even with as thin a thread as this one. Anyway, to close out this rather silly and somewhat all over the place magnetpost, supposedly, Urquhart is near the castle where the Loch Ness Monster's usually sighted. Personally, I think Nessie's totally nestled underneath, deep below the castle. 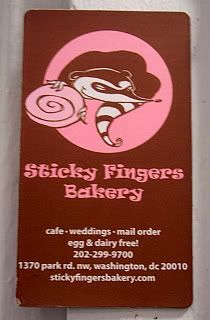 My sister picked this up for me at Sticky Fingers Bakery, a vegan bakery in DC. I know, right? 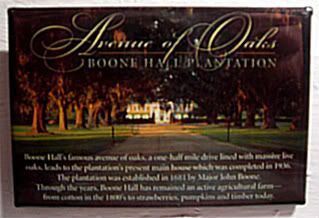 Baked confections sans milk, eggs, and basically all the bad-for-you good stuff that make baked confections to die for? I'm more than a little skeptical, but my sister says they're really good. Hmmm. I'll have to test it out for myself, I suppose. Pictures on the site look pretty darn good, though. Anyway, I picked it for today, because for some reason I've been craving cake all freakin' day. But like, homemade cake. Or, hell, even out of the box cake. I dunno why. I won't lie, the logo kinda reminds me of the Hamburglar...which is a whole different craving altogether. 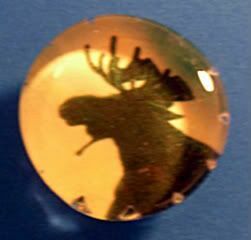 Another magnet from @KristinaMyers' Etsy store - a cool little moose! Love this little guy - mainly because every time I travel to New England, I keep hoping to see a moose. And never do. It's kinda like my bear hunts. This moose reminds me of the best series I've never finished reading, but wish I would. Van Reid and his wonderful Moosepath League. The series is set in 1800s Maine, and starts with Cordelia Underwood, who introduces you to a terrific little universe, which includes the oddly charming Moosepath League - the Misters Ephram, Eagleton, Thump and Walton...and their little tagalong, Sundry Moss. Together the League goes on the laugh-out-loud adventures - oh, not the kind of Superman, but probably more enjoyable and definitely funnier than most. They continue through several books - definitely check 'em out, well worth the read. Ok. I Tweeted it, so no one tell me you didn't know. It's one of the happiest days of the year! No, not because a college friend of mine just got married and looked blissfully happy all evening long. My friend and I went to the Intrepid Sea, Air & Space Museum. If ya'll have read any of my museum posts, you'll know there's rarely a museum I don't like, but truly - this is one of my favorite museums in the entire world. It's on the USS Intrepid. An aircraft carrier! I know! It's the coolest thing ever! 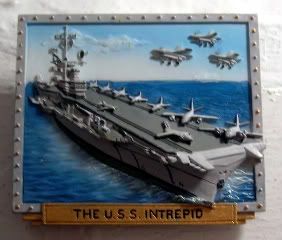 The Intrepid was commissioned during WWII and saw duty in the Pacific, then Korea, became the recovery ship for the Gemini 3 carrying Gus Grissom and John Young, then back on duty for Vietnam and the Cold War. She even served as HQ for 750 federal agents just after September 11th. After being decommissioned in '74 she was given a new mission: To pay tribute to all who sailed aboard her and those still out there fighting the fight (thank you), and to help educate folks on her illustrious history. The Intrepid is still a fantastic ship - now outfitted with a well-designed interactive museum. You can still explore the rest of the levels - adults and kids alike can run all over the boat from the Fo'c'sle to the Fleet Deck, trying to remember what Gibbs and DiNozzo taught Kate about the positioning designations to get around the ship on NCIS. Wait. No. That was probably just me. Still, they did a great job with the new museum. She'd been sent her to Jersey for dry dock restoration a couple of years ago. I still remember all the pomp and circumstance celebrating the first time she'd been set to sail in years. The problem was, when they started her engines, and tried to make for Jersey, the poor thing got stuck in the mud! She'd been there so long, that all the mud had built up around her, and refused to let her go. It seriously took a couple of tries to loose her. It was funny. 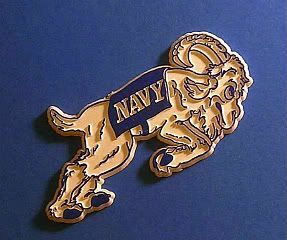 Ya'll never found it suspicious that there's a naval aircraft carrier randomly moored off the west side of Manhattan? Please, that's not for show. I'm thoroughly convinced that if anything dire happens, and we need a hero like the Intrepid again, the boys will totally have her battle-ready in an hour. Tops. You know it's totally true. I'm here! I'm here! Pick me! Pick me! Heh. Well, it's true, at this late hour. 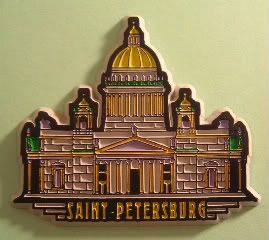 It's a little odd, but rather than downtown NYC, I picked up this blingy magnet on my Albany day trip - the one where I had to train up to drop something off, and then I took the rest of the day to play tourist. I fairly breezed through the NYS Museum, but well worth the trip. They had the Sesame Street stoop! With Oscar the Grouch! They had stuffed native fauna of NY - Beavers! Bears! Beavers! Moose! Beavers! Elk! And an old-timey Automat-thingy! And Roosevelt stuff! And did you hear about the beavers? Seriously, they had a ton of stuff that I wished I'd taken more time to see - from the dioramas of loggers to the rocket car, to the September 11th exhibit to their art collection - it's a pretty big collection. I have to go back for sure. 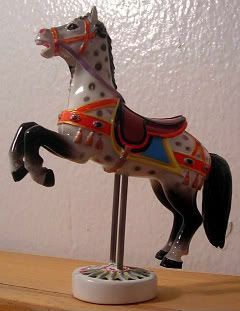 Somehow, I missed the carousel. 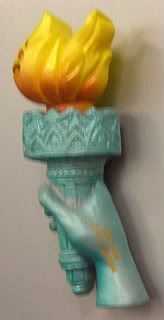 And, because it might be a while before someone convinces me to brave the tourist crowds to re-visit the Statue of Liberty, here's the 1883 Emma Lazarus poem on her pedestal. There's this fantastic article from MSNBC/Careerbuilder with an admittedly very "poor me, I still have a job" slant, that talks about the folks left behind. The ones who somehow, by the grace of the Protect the Bottom Line gods, still have a job. It talks about about how "strategic eliminations" have basically left behind more work for less crew. And honestly? A crew of less-knowledgeable people who are now desperately running and gunning the vacated positions. That impact will have serious ramifications, at some point, and I anxiously await that day. This is not that day. And this is not that magnet. 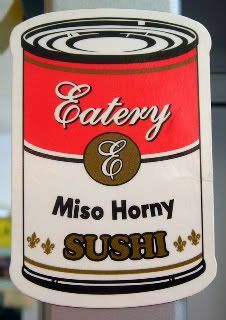 This superterrifically, somewhat inappropriate (and yet charmingly so) magnet, from the funky cool Eatery in Vancouver, came from a new friend I made out that way. He became a superterrifically valuable resource for me. He jumped in, guiding me through his questions, dealing with my manic, "OMG, how will we ever get this done and I have not a clue what I'm doing because we're so freakin' stretched they're letting advertising account managers do things outside their realm and even if it's not rocket science, it's now something that's totally getting added to my resume," so please help a poor soul. By the end of a late night, we at least managed to set up the backbone of the shoot, ready for the real!producer to guide the rest of the process. Whew. There are times when I love this business, and the people in it. It's not often, but when it happens, those people are like gold. Especially when they send you a magnet, without any clue why. Hahaha, thanks for the help, the chuckles and the magnet, Jean Pierre with the supercool last name from Vancouver! Now you know! Although, I will say, that after all that we went through all that agita on a Friday night (did I mention Friday?) to get that shoot set up, all we got from the client? "Great. But note that our name is spelled wrong in the subject header." S'truth - I never have been able to resist a well-designed set of magnets. Yay for the Met. And their clearance store. As for Pauly boy's quote here? Well, it's either wishful thinking, or truth. Depends on the day, methinks. If you haven't learned by now, we'll tour anything. So, from time to time, we end up taking tours of places that have no real interest for us. Case in point. 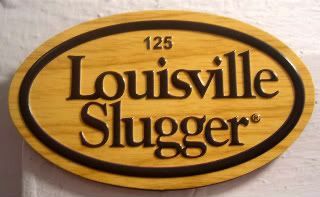 The Louisville Slugger Museum and factory tour. I'll be honest. We're not huge baseball fans. BUT. We are "biggest [insert object here] in the world" fans. And that's what they have! The world's largest bat! Leaning up against the building! Batter up! Literally! It's freakin' awesome! I loved it! It was a bit of a hard sell to the parents given that we were racing for Louisville (indeed, we were on the last tour of the day), but we figured with all the wood around, my dad with the mad carpentry skillz would appreciate it. My sister and I were mildy fascinated, while my dad resisted the urge to start a bat business. And my poor mother seemed bored out of her mind. Anyway, I picked this magnet for today because of my latest predilection for NCIS, which is premiering tonight. After all, if I hadn't taken that bat tour, I never would have solved that one NCIS case before Gibbs and his team. Abby was peering into the microscope at a wood splinter, said something like, "It's Ash or Maple," and I bounced up on the bed and yelled at the tv, "It was a bat!!!! It was a bat!!!!" Boom, baby. I could totally be a crime fighter now. 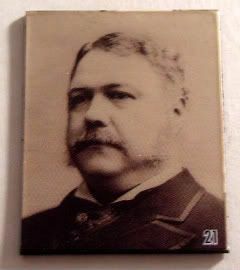 Chester Arthur was sworn in as the 21st U.S. president today, following the death of James Garfield, who was shot two months earlier. So after reading a couple of articles about "Chet," here's my favorite, even if I can't find a second source for it. His wife passed away before he took office. She was the love of his life, and in her honor, he had a stained glass window installed at St. John's Episcopal Church. At night, they would light up the window, so he could see it from his office. It's apparently still there to this day. It's been a while since I've used a regular fridge magnet. I picked up this promo magnet at BEA earlier this year - didn't get to see the booth where it came from, but it's for the book, Inside the Minds of Car Dealers. It was just after the collapse of one of the major car dealers, because I remember thinking, huh - I bet I know what's in their minds right now. Then I thought I'd use it for when something big happened in the car industry. Uhhh, well, I missed that one, I guess. Heh. I picked it for today, because last night, after another long day at work, I called for a car service. Generally, the drivers let me sit quietly, but this one was supernice and gregarious, telling me, "you know, you're famous. I just told my friend who I was taking home, she said, [insert my name here], and said [insert my address], and she said, 'yes! Oh, she's a nice lady!'" As it turned out, it was the boyfriend of Sophia, of the few female drivers in the fleet, who has brought me home several times. He gave me his phone to say hi - because it's been a few weeks since I've seen her, and a lot's happened since. Anyway, that "hey, I know you" exchange ended up in a long drawn-out conversation on the trials and tribulations of Americans and Corporate America. Mostly, how we've lost our identity as a country, and we don't recognize ourselves anymore. And how the world is a different place now. That, and how you have to always be prepared, because you never know what's going to happen after midnight. Why is Kansas City in Missouri? Why are there two Kansas Citys? Why didn't one Kansas City say to the other Kansas City - dudes, that's our name, get your own damn name? Do people from one Kansas City like the people from the other Kansas City? Is there a bad Kansas City to be from? What must it be like to be from Kansas City, and go, nooooo, the other Kansas City? How much of a pain is it when people don't know that there's actually two towns? Do they get each other's mail? Yes. It's these things I think about when I think about Kansas City. Missouri. Or Kansas. Someone brought this magnet back for me - I've never been, but now, I think I have too many questions not to go eventually. And, yes, I've already looked up the factual answers to most of the above. I just liked asking the questions. And, as Voltaire (and our shiny new biz deck at work) said, "Judge of a man by his questions, rather than by his answers." Lord, I don't even want to know what this post says about me. When you judge of me, judge well. Oh, yeah. Now we gots a theme going on up in here. How's this for random? My sister forwarded me the Columbus, IN, visitors site last year, after having learned that the town was deemed a "Jewel of the Region" by National Geographic. Why? Because it's considered essential to American architecture, a veritable hotbed of cool buildings and art. Really! And, when I saw the site, I dimly thought, huh. Lovely place. But, honestly, when's the next time I'll be in the heartland of America? Fast forward about eight months - as our Chicago roadtrip turned into a desperate search for a Chinese restaurant for my dad's discerning palette which then devolved into a desperate search for just any place to sit down and eat, we found ourselves in a rather dilapidated Denny's. Don't get me wrong. I love Denny's. But sometimes, when you're looking for Chinese, a semi-congealed Grand Slam breakfast sandwich at 2 in the afternoon isn't always what you're lookin' for. But, I digress. So we're sitting there in Denny's wondering why we passed a wayfinder sign saying, "Architectural Tour." And suddenly, like a bolt of lightning, DC Sister and I realized we were in the hotbed of architecture! A little magic on the Blackberry landed us in the pretty busy visitors center. The town proper is terrific. But what I loved was that wherever you turned on the city grid, you saw folks walking around...with the same map in hand. The maps that told us where the Saarinens were, along with the Pei, the Meier, and even the Dale Chihuly. Eeeee! It was like a scavenger hunt! 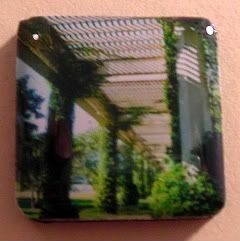 This magnet (purchased at the sweet little shop shop with the nicest ladies ever) is of Pritzker Prize-winning Kevin Roche's Cummins Corporate Headquarters. This place was one of my absolute favorites in town. So neat, I took the same picture, without realizing I had the matching magnet, from this more-to-come-of-course magnet set. Don't know Cummins? They're one of the largest manufacturers of diesel engines - with the funnest corporate history I've seen in a while. Ya'll have to check out the videos in that link. I'm half in love with their founder now. This guy, Cleesie Cummins, used to take cross-country trips like no one's business, back in the 1930s. He was one of the first folks to put diesel engines in buses. To prove it would work, he drove one cross-country, with two reporters in tow - all told, using 365 gallons for the price of $21.90. He was also one of the first to put a diesel engine in a cool passenger car - an auburn convertible. He then drove that to LA - 3,774 miles for the grand total of $7.63. Annnnd, don't get me started on his many race cars on the racing circuit. Hee, what a fun (for me) post! C'mon. Where else are you gonna get architecture, Denny's, roadtrips, industrial magnates setting world records - all in one fell magnetpost? The first time I went to Buffalo, we didn't do our research before going - instead, we just drove around Buffalo. It was freakin' cold, and I remember lots of snow, and we didn't stop the car. Like, at all. Like, we exited the highway, drove around, and got back on the highway. No joke. I mean, it was a classic speed-dating city drive-through. Only instead of knowing what we were passing, we were going, Hey! Lookit! There's a buffalo in Buffalo! I mean that literally - you know those cool art project animals they always have? That's what we were gawking at. I have pictures - albeit slightly blurry. What with us being at a stoplight and pointing and clicking. Gravy. It's why I hate not doing city research ahead of time. 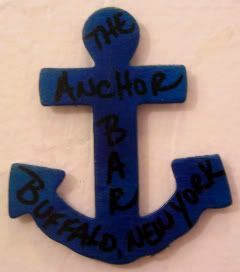 We missed so much in Buffalo on that one trip, up to and including, visiting the home of the original Buffalo wings - the Anchor Bar. So, yay for coming home after a crappy day yesterday, and being surprised by a little pick-me-up package from a friend who just got back from there! Woot! Yay magnets! No worries. One weekend, I'm planning on running away from all this and visiting Buffalo (Yes, Buffalo! Haven't you been reading? That's what this magnetpost is about!) - and seeing its many, many cool buildings and doing the many, many fun things to do there. Can't wait! No, seriously. Most of you have probably read this magnetblog long enough, to know that I'm serious. I can't wait. And the Dutch NY400 fun continues! Having woken up late this morning, I hightailed it down to the tip of Manhattan, so that I check out Holland on the Hudson. First, dudes! Flotilla! So much fun watching the boats sail by - sharing the waterways with frigates and ferries and water taxis. But, as you watch the historic replicas sail by, you kind of get a feel for how this land must have just looked really inviting on first site. The boats kept buzzing the port, to the cheers of all the onlookers lining the railings. I loved the Royal Marine Band of the Royal Netherlands Navy, even though I got confused because they were playing our armed forces theme songs. Still cute. There's something about a boy in dress whites, playing his...piccolo? Then, as it turns out they were totally not joking about having a little New Amsterdam village on the Hudson. The tiny little village was squished in front of the Old Customs House. It was small, but it was cool to try some of the native yummy Dutch foods (I couldn't do the salmon or the little fishy sandwiches, sorry), and to see the guy making little Dutch shoes. He's been doing it for four generations! 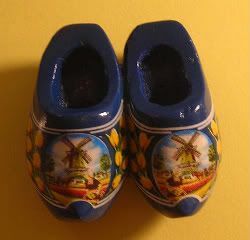 I could swear, though, that when I went to the Netherlands a few years ago, my Dutch host mom was like, dude, Holland's not just about the Dutch shoes, and no, Joy, we don't all wear them. So I feel kinda funny putting up this magnet. They totally blocked off the little village though, when the Netherlands' Prince of Orange and Princess Máxima came to visit! So funny to watch all the people paparazzi the poor folks. While the royals checked out Little Amsterdam, I checked out Cass Gilbert's Alexander Hamilton's U.S. Customs House. Such a gorgeous Beaux Arts building - amazing, inside and out. And, thank you Smithsonian for the free museum George Gustav Heye Center of the National Museum of the American Indian housed there! So interesting to see the Native American women's dress exhibit - I was a big fan of Terry C. Johnston's Titus Bass series, so it was interesting to put a tiny bit context around his books, even if it was just trying to figure out what the women were wearing. Heh. Whew. What a long, long multicultural day. I can't believe how much stuff was going on here this weekend - there was the NY400 activities downtown, the Broadway on Broadway stuff in Times Square, Fashion Week in Bryant Park, the MS Race, and lord knows what else. Seriously, unless you're dead, you can never be bored in NYC. Another reason to love this town. Happy 400th, New York! Apparently, it's the week that Henry Hudson arrived in New York Harbor on his Dutch ship the Halve Maen ("Half Moon"). He was looking for Asia. He got us! NY400 Week is a weeklong celebration to honor the city's Dutch ancestry - with supercool events and festivities all around town. Love it. Seriously. I live for extremely well-coordinated, nicely branded, multifaceted, multifacilitied events like this. What? I do! Take for example, today. I went over to the Museum of the City of New York, where you can spend hours just looking at all the cool NYC stuff. In addition to the superfab photography installations, they've got this really well-done new multimedia presentation called Timescape, where Stanley Tucci takes you through the history of the City from when the Lenapes (Len-AH-pays, what, it was a museum, I totally learned stuff and now I'm sharing!) 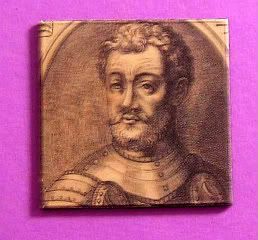 got hoodwinked sold the island of Mannahatta to Peter Minuit in 1626, for something like 60 guilders ($24 bucks). There's also a smells-like-new-cuz-it-supertotally-is exhibit space about Henry Hudson's Amsterdam and New Amsterdam. Which has a model of the Halve Maen, plus some really cool stuff they dug up downtown. No, really. And, there's the Mannahatta Project that takes you back in time (with bears and beavers and really looks-cooler-than-you'd-think-cuz-it-supertotally-is giant lightboxes) to what our little island looked like back in the day. Finally, a nod to the Dutch, where they selected a few Dutch photogs to run around the city taking pictures. Great stuff. MCNY was just my first stop. After picking up this neat magnet of 1672 new Amsterdam in the still-too-small-for-its-space-cuz-it-supertotally-is little shop, I flew through the exhibits again to actually see it for myself. Didn't see it, so I gave up and moved on down to the Met, to go see the Vermeer exhibit. Very crowded, but well worth the fighting. Awesome exhibit. 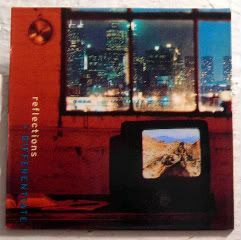 And I'm not a big Vermeer fan - in fact, there's a part of me that's thinking he's the new Degas in my book. Great artist, a touch of the dirrrty. Don't deny it. And then, as I was walking through one of the NYC historical imagery galleries, I found the color version of this image on this magnet! Woot. 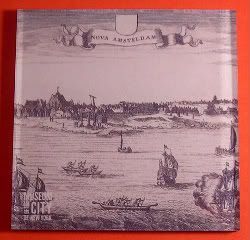 Mystery solved: Apparently the watercolor of this thing is sitting up in The Hague, and shows New Amsterdam at about 1650, complete with natural shoreline. You can even see a small dock and crane right in the center! What I really like about this view, is that you can see the packet ships, the cargo ships, and the little Native American ships all sharing the harbor's waterways. Kinda like now, only with the Water Taxis, scary speedboats and ferries. It's why I can't wait until tomorrow, because apparently they're gonna do some big "Holland on the Hudson" Flotilla thing in the Harbor tomorrow for NY Harbor Day. So damn cool. Although, I won't lie. The entire time I was lookin' at old-timey etchings, sketches, paintings, photos, etc., I was thinking that cuteboy Nikolaj Coster-Waldau's Nick from New Amsterdam (the Fox show that should have stayed on longer) would have totally been identifying his pals in each of those images! 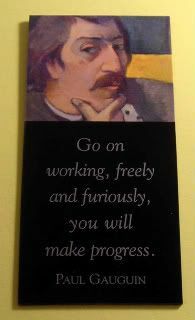 This magnet's from a set that I bought from the Met, but I gotta be honest - I can't figure out if it's really an Alfred Stieglitz. It's called Financial District by Samuel H. Gottscho, a native New York photographer who was known for his city skylines done "in straight-line perspective and sharp focus," according to the Museum of the City of New York. I was confuzzled beween Gottscho and Stieglitz. Hmph. Yep, that's not annoying at all. Looks like I totally need to pay another visit to the museum, huh. Eight years ago today, my biggest concern walking into the office that morning was wondering whether or not it was too late in the year to be wearing the periwinkle-and-white striped button-down, matching periwinkle shell, light gray skirt, and black sandals I had on. An hour later, the world changed. Because everyone needs a little happy now and then. What? My friend got me all these magnetic supplies, so blame her for the monster she's created! 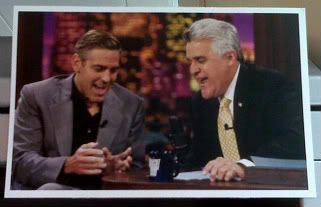 I had this postcard from the nice folks at the NBCU Photo Bank, and have thusly converted it into a magnet! Woot! It's pretty apropos for a couple of reasons. First. Jay, Jay, Jay. I heard somewhere that your show is starting next week on NBC weeknights at 10pm. Hmmm, now where did I hear that...? Oh, yes. Everywhere. Seriously. You're stalkin' me, man. On TV ads. In Times Square ads. On FB. On messageboards. On Twitter. And that doesn't even count the PR/TVcrix blitz! Oiy. I love you man, but overkill on the marketing dollars. Also? I hope the new timeslot works out for you. And NBC. Second. George, George. George. The festival season has begun, and my boyfriend and his (real) girlfriend are making the red carpet rounds. (Hmph. My boyfriend certainly has a type, doesn't he.) But, back to the movies - between his serenading O Sole Mio and the many flicks he's showing at many festivals, he's wowing all the crowds at many turns. Let's see, there's The Men Who Stare at Goats, which I can't wait to see, even if Clooney's sportin' a 'tache that just isn't cute. There's Up in the Air, which I can't wait to see, even if Clooney's playin' a professional terminator. And, there's Fantastic Mr. Fox, which I can't wait to see, even if Clooney's pretty mug will be in the shape of (fittingly, albeit dated) a fox. Hee. It's gonna be a busy, busy rest of 2009, Clooney-movie wise. I love when he goes on a new movie tear - it means he's totally gonna be on every A- and sometimes B-list talk show and in every entertainment magazine, blog and website. Yay for press junkets! Mind you, my problem is that by the end of it (like every other junket), once you've heard the same messaging and the same stories, you've heard them all. Literally. That's ok. No doubt, I'm perfectly happy hearing George tell the same (not about the new girlfriend, please have mercy) stories til the foxes come home. Here's why I should never be a Nielsen family: I skew show demographics like no one's business. It's not often that someone from the same demo watches Disney's Wizards of Waverly Place, ABC's Brothers & Sisters, BBC-A's Doctor Who or Top Gear, Lifetime's Army Wives, CBS' NCIS, and FX's Sons of Anarchy. Can't help it - I love my tv in all its many forms, from cute to brutal. Add in a pretty boy and a love story, and I'm a goner. Sons of Anarchy is one of those shows. Brutal, I mean. If you haven't watched the show, think Sopranos (which I never watched), with a gun-running, outlaw biker gang, taking care of their own in Charming, CA, and meting their own brand of justice along the way. I don't mind saying that I had a pretty visceral reaction when I saw the first previews last year - you couldn't have paid me to watch. Not my cup of tea. But, if you've read any of the television posts on this blog, you know I totally had to give it a shot. It's what I do. Sucked in. From the supersick opening titles with the fab ink graphics to the fanfreakin'tastic soundtrack - Sucked. Right. In. Anyway, after I got over the distasteful aspects (the outlawing, the violence, the supremacy of the other, other bad guys, etc. ), I found myself left with a heap of engaging character complexities and impossible situations, brought to life by superb writing and raw acting. Seriously, in what other world would Beauty & the Beast's Vincent Ron Perlman and Married with Children's Peg Bundy Katey Sagal be believable as Clay and Gemma, the aging patriarch and matriarch of an MC. 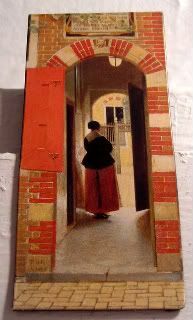 In what other world would you be so engrossed in small touches of their lives (her menopause, his arthritis) and the well-being of their relationship (his infidelities with a tarty-tart, her spending the night in jail for smacking that tarty-tart upside the head - with a skateboard) that you forget that they possibly murdered her first husband to be together? And, these two are just the tip of the iceberg - it's a magnetblog, remember? 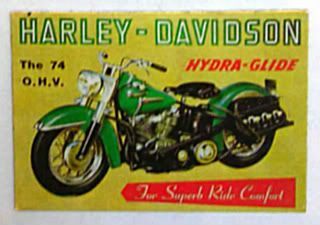 Of course, the Harley on this magnet is totally something that the Samcro boys would have to modify the bejeepers out of before taking out on the road. Yeah. Don't even get me started on the superawesome bikes. Season 2 starts tonight at 10 on FX - this preview pretty much sums up most why I'm watching. Check out Maureen Ryan's and Alan Sepinwall's reviews for real reasons why you should be watching, too. OMG! I don't know how I forgot about this! But, now I'm wondering if the Samcro clubhouse is anything like the old Hell's Angels haunt we used to pass every so often down in NC. And every time we'd pass it, Mom would be like, "that's where the Hell's Angels are!" as the whole family would look to the left as we passed. Oh. My. Good Gravy. That was one helluva season premiere. Ya'll better catch up. For realz, yo. There's a book I read in fourth grade that I've seriously been trying to track down forever - a little mass-market called The Last Cow on the White House Lawn, and Other Little-Known Facts about the Presidency. Of course, now Amazon has it listed. Of course. I know it's out of date now, but I must have read that thing cover to cover a few times, because half of the presidential factoids and half-a-facts (/tm David Tennant) in my head come from that book, or others just like it. Elected as the "advance agent of prosperity," his administration was credited with helping get America out of a recession. Shortly into his second term, McKinley was at the Pan-American Exposition up in Buffalo (a world's fair type deal), in for just a couple of receptions and a military review. Supposedly, his secretary was worried about the security risks, and totally didn't want the president out and about. But Mac was like, nu-uh, who's gonna get me. Anarchist Leon Czolgosz, that's who. 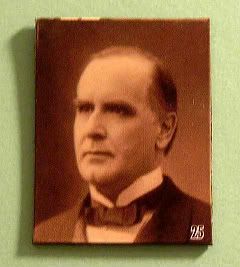 It's said that McKinley he used to always wear a flower on his lapel, supposedly for good luck. At the Pan, there was a little girl who had been in line to meet him. Apparently, she was supersweet, and asked for something to remember him by, and the president removed his good luck charm from his lapel and pinned it on her shirt. Not two people after her was the shooter, Czolgosz, hiding his gun in his handkerchief, waiting his turn to greet the president. It's weird what the mind retains, because while I can't remember what I had for lunch yesterday, in my head, I can totally picture the accompanying illustration of the president leaning down to give the little girl his pink carnation, with the guy waiting in line, hiding the gun. Freaky. "Bein' ugly" is a phrase down South that I've heard for most of my life - it's a catch-all phrase for when people are being rude, and in general, for conduct unbecoming. I've said it a couple of times up here in New York, and each time, I've gotten funny looks for saying it. But, it's something that always goes through my head (oddly, in one of my former BFF's voices), whenever I'm doing something wrong, or I see someone being, well, ugly. I'm seeing a lot of that going around of late. 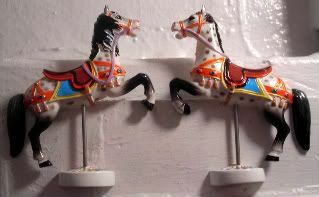 Everywhere I turn - at work or on the subway, wherever - it feels like I'm seeing more and more people infighting and backstabbing, badmouthing and playing the sycophant, being passive-aggressive, short-tempered and rude, and being just plain ugly to one another. I feel like it's not just me - that the reason it's everywhere, is that it's just something that's inherent to bad economic times, where people are just under more stress, and closer to their breaking points. Believe me, I'm no exception to the rule. Even when it's deserved, it's still disturbing to see, and embarrassing to be a part of. And I suppose we can't do anything about it, except behave. And be the best people we can be. Oh. And for me, occasionally scream at the top of my lungs, "Stop bein' ugly!" 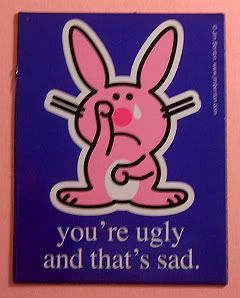 But if I may take a moment to be ugly...now that I've had time to mull on yesterday and some time to think about today's magnet. This post might seem like I'm chastising a few aggressive comments made here, on Twitter and on Facebook yesterday. I'm not. Clearly, my dear readers and I are noticing too many similarities to my writing style in other content being put out there. Clearly, I'm not happy. Clearly, I can't copyright writing style or voice, or even content. But I'm done with being passive-aggressive. This is me drawing a line in this magnetblog sand. Here it is: Not to be ugly, or anything, but find your own damn voice and stop trying to steal mine. Oh, Shakespeare, how little did you know that your work would be used for a superUOA in 2009? An Unpopular Opinion Ahead so unpopular, it could get me staked, even. I loved The Lost Boys in the 80s. I loved the silly Dark Shadows remake in the 90s. And, like everyone else, I loved/watched/own Buffy the Vampire Slayer and Angel. I even watched Moonlight and Blood Ties. I dabbled in reading Laurell K. Hamilton back in the day. And, I totally know there's more out there. But, my fingers got tired. But all of that? That's just on TV. Not counting movies. Not even counting every single vampire romance/sci-fi/fantasy book series, webseries, comics and manga series out there. 67,000 search results under books alone on Amazon! I swear, no offense to anyone who is in love with the glittery Edward, or dug (yuk-yuk) the Bill/Sookie cemeterysex, or who's reading the latest vampire romance..but everywhere I turn these days, there's another bloodsucking image, and complete vampire market saturation. So, yeah. Over. It. Someone get a vampire slayer in here stat. No, wait. They already did that. I picked up this magnet at the Greensboro airport in North Carolina a few years ago, when the First Flight Foundation helped celebrate a century of flight. I was sad I didn't get to join in any of the festivities. 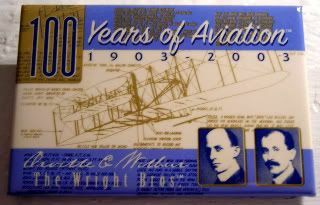 The Wright Bros remind me of my first and only visit to the Outer Banks. I know. And I call myself a Carolina Girl. But after a terrible, terrible night where my mother was bitten by some bug that landed us in some rural clinic's parking lot in the middle of a somewhat scary night, having woken up some poor doctor to help my mom out, uh, yeah - we never went back. Well, I guess they deserve every pretty penny. After all, who would have thought that a century later, a team could spend today daytripping from New York City to Houston (fly down, attend meetings, eat lunch, and fly back) all in less 18 hours flat - with about seven hours flight time. Quite an amazing feat, if you consider that driving down by car is just over a day's travel, riding the rails down is about two days' travel, and if you're curious, about 50 days. By wagon train. Hey, Wright Brothers? Thanks a mil! During that Chicago roadtrip earlier this summer, my sister and I pulled night-driving duty through Indiana. No offense to Indiana but our impressions? Dark. Flat. Never-ending. Frankly, boring. And where are all the people? Don't they have to live near highways? So, then on our way back in the daylight, we were shocked. Shocked!, I tell you. Light. Flat. Never-ending. Frankly, boring. 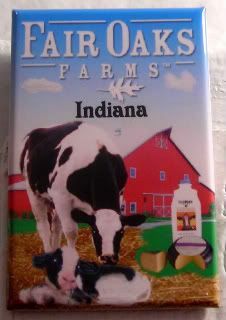 That is, until we started seeing these superpunny cow billboards convincing us we needed to stop at Fair Oaks Farms. Not one, not two, but at least a few superpunny cow billboards. So, of course we had to stop. After all, how could we resist cows double dairy'ing us to have a dairy great adventure? I've now confirmed on their supercute and pretty darn robust site that what little we visited of Fair Oaks Farms was just the tip of the udder, because apparently, there's a thing called Mooville Adventure Center, plus the dairy barn tours, playareas and a birthing barn (ewwwwe) and a 4D theatre, some sort of cowculator, and it goes on and on. And it's all supercutely branded by a dairy extraordinary marketing team. We were really glad we stopped in at Fair Oaks. These folks know how a create a branded experience - for that, I can forgive your extremely overpriced magnets.